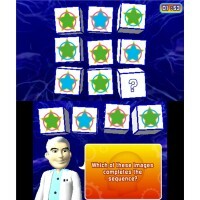 Dr Kawashima’s Brain Training proved that a system seller doesn’t have to be big budget or be packed with pretty visuals. It took nine developers just three months to make and went on to sell millions. You’d think that Nintendo would have tried to recreate its success with the 3DS, but no, they’re seemingly happy to let Ubisoft release the first brain bending package for the handheld. Presentation is surprisingly colourful with blue and orange chosen as the predominant colours for the menus. 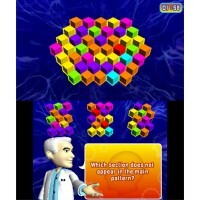 If you were to forget to activate the 3D while playing then you wouldn’t be missing out on much though – there’s a little bit of 3D flair here and there, such as a maze which sinks into the screen, but for most part you’re forced to stare at little more than random shapes and cubes on the top screen. It has been designed to be a 90 day program with the idea being to tackle one set of puzzles per day, but you can plough through them at your own pace. 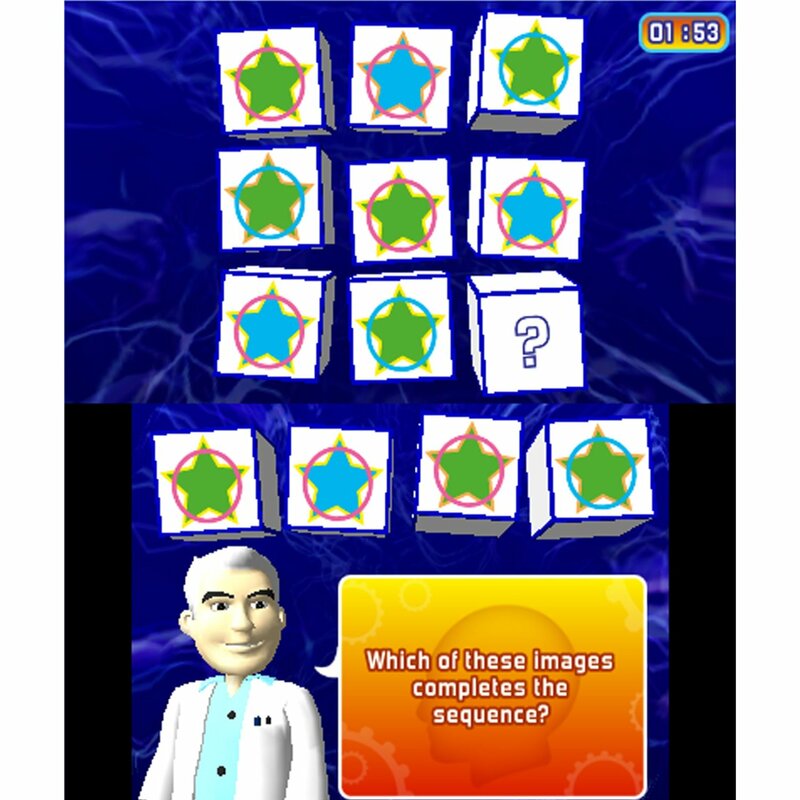 Each set of puzzles contains four warm up exercises and four challenges split into four categories – memory, numerical, visual and word. You need to get at least a grade ‘C’ during the warm ups before being let loose on the challenges. Professor Ian Robertson, who is a dead ringer for TV’s Roy Walker, is on hand to explain the instructions for each game and also gives out a few handy tips for improving your grey matter. The memory games are things like having to remember items from a shopping list or the code to crack a safe. 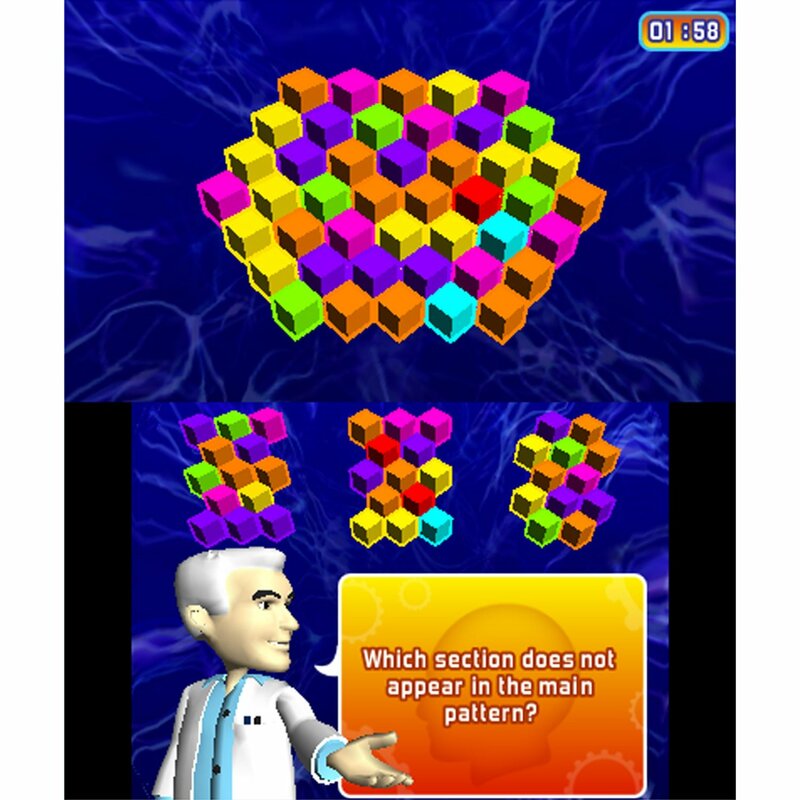 Numerical puzzles involve adding up the price of somebody’s shopping and working out the weight of items placed on scales, while the visual puzzles mostly entail working out logical sequences and counting how many blocks are missing out of 3D shapes formed from cubes. The word games are ones that we found the most engaging, including word searches and spelling words backwards. There’s also a game called Word Confetti in which words float down the screen and you’re asked to pick out all those related to certain subject. This one is more challenging that you might think as the developers have cleverly picked words that look alike to one another, such as ‘bananas’ and ‘Bahamas’. As the words are quite small on the screen you do often end up picking the wrong one. Unfortunately, there are a few other little niggles similar to this in the other games too. As a whole this isn’t a bad little package even though it isn’t a very good use of the 3DS’s technology. Minus the 3D effects there is nothing here that couldn’t have been achieved on the original DS, and there are no Street Pass features to speak of. If that doesn’t bother you then it should at least see you through until the next brain training game arrives. What’s a good gym workout for someone just starting out and very out of shape?